While many people think of facials as a relaxation practice, there are many health benefits to these treatments. Facial treatments can do everything, from clearing clogged pores, to quenching parched skin and extracting blackheads. The massage component of facial treatments increases blood circulation and lymphatic drainage, while reducing puffiness and sagging in the face. Facials are also a proven way to combat stress, which is responsible for premature aging, shortening the life span of skin cells and aggravating conditions such as acne and rosacea. Certain massage techniques relax facial muscles, promoting skin cell renewal and slowing the onset of wrinkles. Microdermabrasion, Skin Peel and LED – smooth your skin and fight inflammation, ageing, breakouts or pigmentation. Vitamin A Rebalancing – detoxify, purify and heal your skin. Vitamin B Refining – experience a nutrient rich cleanse and light peel to smooth and condition skin. Anti-Ageing Hydra Restore – hydrate dry, aging skin and promote optimal skin health. 3-Layer Hyaluronic – quench dry, to reduce fine lines and promote optimal skin health. Hope Island Signature – target the face and neck for firmer, more hydrated skin. 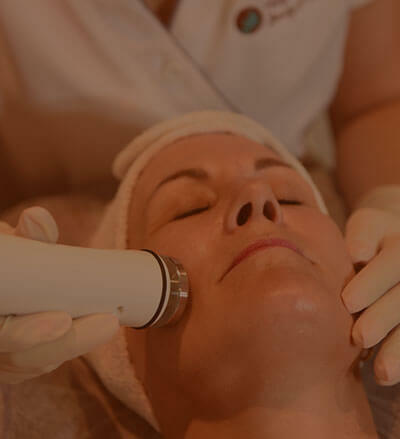 Oxygen Lift – deeply exfoliate and enrich your skin leaving you refreshed and rejuvenated. Radio Frequency Facial – stimulate collagen production to firm skin and soften lines. 24kt Gold – experience as 24kt gold stimulates circulation and collagen production to plump and smooth your skin. All or facial treatments combine quality skin care products and or medical treatments with the revitalising properties of facial massage to give your skin the ultimate rejuvenation experience. To schedule one of our full facial treatments, call us directly or book online. If you don’t have time for a full facial treatment, then why not check out our range of express facials.